Every Shabbos and Yom Tov, the shul provides regular youth services to accommodate the needs of our growing community. As the Yom Tov schedule is exclusive to each holiday, the specifics will be focused on the weekly Shabbos schedule. Please be aware that a parent must be readily available to take responsibility for the child while he/she is attending groups. Babysitting is a supervised free play program for boys and girls ages infant through 3 years old. This group is staffed by our babysitting director and other professional sitters. Gan Shabbat is for boys and girls in nursery and Pre-K, the children are entertained with stories, games, songs, and organized activities. Tot Shabbat is for boys and girls in 'K' and 1st grade. The children are entertained with stories and songs; they pray together and play together with organized activities led by our teenage group leaders. Junior Congregation now meets with distinct groups for boys and girls for grades 2 through Bnei mitzvah, and the girl's group is for grades 2 through B’not Mitzvah. The children begin their morning with group morning prayers and continue with questions on the parsha, stories, and other activities. NCSY Teen Workshop is a discussion based group dedicated to giving deeper insight into the Parsha and general hashkafa and is for boys and girls b’nei mitzvah through 12th grade. This group is currently studying the Ethics of Our Fathers and is led by Joey Hamaoui. This class meets regularly on Sunday mornings from 9:15-10:15 AM. Rabbi Mayer Rabinowitz will teach this class. 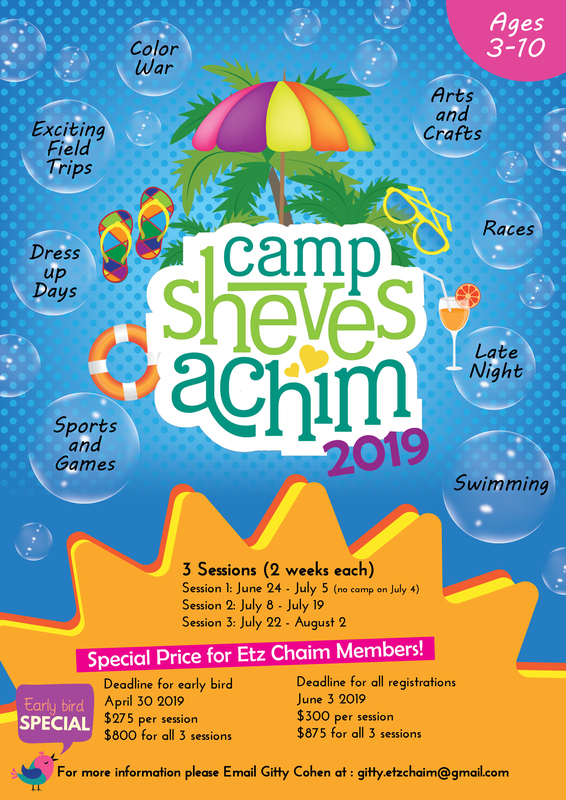 The vision of the Yom Rishon Enrichment Program at Etz Chaim Synagogue is to expose and educate the children of their heritage in a fun and engaging manner. Students will enjoy attending and find the learning both stimulating and rich with content. Every week the students will learn the upcoming week's Torah portion with a goal that they will be able to relate the story. The students will learn the storyline of the Torah portion with all the relevant mitzvot. The learning process will be with wit and humor to ensure that the children enjoy attending and participating in the program. Before the Holidays the students will study some of the mitzvot, customs, and practices of that particular holiday. The children will recognize the symbols and religious articles associated with each holiday and learn their significance. Don't miss out! Enroll your child today to take advantage of this wonderful opportunity! 7:15-8: 15 pm as we debate how Torah knowledge relates to contemporary issues. This brand new class is open to boys and girls in grades 8-12. Piping hot pizza and drinks will be served. This is a Judaic studies program designed to enrich the lives of today’s teens with authentic Torah education. The curriculum focuses on providing the students with the tools necessary to maintain a strong sense of Jewish identity and with the practical know-how of Jewish living. With the strong emphasis placed on utilizing the limited time available to our high school students, every moment of class time is injected with genuine Torah content. Our goal is to provide our younger generation with the mindset and knowledge necessary to successfully cross the threshold of adolescence into adulthood with a sense of purpose that mirrors the legacy only they can carry on.